CD Projekt's DRM-free philosophy apparently doesn't hold back high sales. People have taken a liking to the monster-slaying, potion-brewing, lady-wooing Geralt of Rivia, and there are numbers to prove it. The Witcher franchise has moved more than 4 million units worldwide, according to a statement issued by developer CD Projekt RED. The figure covers both The Witcher and The Witcher 2: Assassins of Kings, and includes PC, Mac, and Xbox 360 sales. Adam Badowski, head of CD Projekt RED, is certainly pleased with the numbers, stating that he is "still amazed with the result" of having the games go quadruple platinum. The White Wolf now has its sights set on the land of the rising sun; The Witcher 2 will arrive in Japan for Xbox 360 gamers on August 23rd. 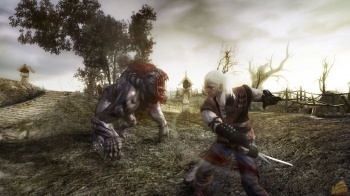 Mac owners will also be able to play The Witcher 2 later this year. The sales volume is definitely impressive, and close to matching the illegal download estimates made in late 2011. CEO Marcin Iwinski surmised that The Witcher franchise had been pirated about 4.5 million times, and further admitted that "the reality is probably way worse". In spite of this, the company continues to have a firm anti-DRM stance, and it encourages other companies to do the same, insisting that its existence complicates consumers' lives. That doesn't mean that the company condones people enjoying its hard work for free, either; earlier this year, letters were sent to German residents demanding fines of €1,000 for illegally downloading the game. It's great to see such a positive result for a company that's taking a position other developers would consider risky. We'll see if this mentality continues to yield more positive results for its future releases.